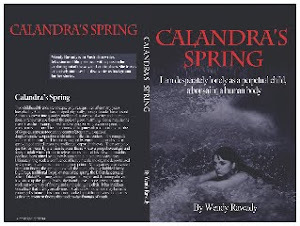 Calandra's Spring book: Verisimilitude the key to a good story. 'Verisimilitude' or the appearance of reality, is possibly the most important factor in a story. We know, for instance, that when one is taking sheets of the line, it is impossible to ascend into heaven, but Gabriel Garcia Marquez made it seem perfectly logical in '100 Years of Solitude' (great title by the way!). It is very important to establish a sense of consistent logic in your story, whether that is in regard to something that has a quality of fantasy, magic or ridiculousness about it. Books by Ben Elton have the latter, but they have a consistent thread. Part of the writer's craft is to research those elements that make the narrative flow without the reader hitting speed-bumps of inconsistency along the way. That can be geographical, character/action, language and dialogue used or any number of things and it's why the process of writing is called 'craft'. You stitch it together over and over until you have balance of design, fabric and neatness! The latter, by the way, isn't necessarily boring or pedantic. I have read many books that contain long lists of description (works of Balzac, Proust and yachting expert Doug Danielson for instance) but these passages add to the realism of the story in each case. How you tie your detail to the story is the key and you need to avoid swamping the story arc in diversions that, ultimately, could have been deleted by a sharp editor. Descriptions need to advance the narrative. Your reader needs to believe in a sense of place that you create and re-create your characters in his/her mind's eye. What you are doing is boosting the imagination of the readers, taking them to places you want them to go. I love it when I have written something and people describe a character and I am able to say 'That's exactly how she was conceived in my mind'. That's a golden moment for any writer.